Here is today’s stop on the Jared Sandman’s Blogbuster Tour 2011. 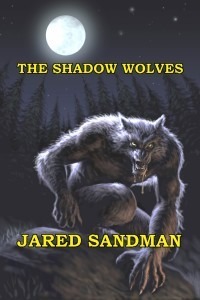 Jared Sandman’s Blogbuster Tour 2011 runs from July 1st through August 31st. His novels include Leviathan, The Wild Huntand Dreamland, all of which are available at Amazon, Barnes & Noble and Smashwords. His next book, The Shadow Wolves, will be released in August. Follow him on Twitter (@JaredSandman) and be entered to win one of several $25 Amazon gift cards. See rules at www.jaredsandman.com for eligibility. Paul Mudie, cover artist for my fourth novel, The Shadow Wolves, has agreed to answer a few questions about his work. As most people do judge a book by its cover, I wanted to give him the opportunity to explain his methods.What made you want to become an artist, and how did you break into the field professionally? I don’t remember making a conscious decision to start drawing and painting, it’s just something I’ve always enjoyed doing. When it came to making a career choice, it was a bit of a no-brainer because there wasn’t much else that I was any good at! Who are your influences stylistically, and which artists are your favorite? I spent most of the ’70s and ’80s reading comics (particularly 2000AD) and poring over books of horror, fantasy and science fiction art, so all of that must have gone into the blender. I remember being very impressed by the Tim White covers for the Lovecraft Omnibus paperbacks that were published by Grafton in the mid ’80s. And I’ve always admired the work of Gustave Doré and HR Giger. What’s your artistic background? Are you self-taught, or did you graduate from a formal study program? I would say that I was self taught, but that I was able to develop my skills a bit by studying art at school. After that I tried to get into the degree course at Edinburgh Art College, but they wouldn’t have me. Luckily I managed to get a place atEdinburgh‘s Telford College, and studied Scientific and Technical Graphics there, specialising in illustration. Take us through the creative process for creating a piece like the cover art for The Shadow Wolves. I start with the basic idea, and try to get a clear mental picture in my head of what the finished illustration should look like. If there are elements I’m not sure about, I’ll go and find some visual references to work from — in this case, photos of wolves. Once I’ve got a clear idea of what the thing should look like, I sit down at my PC and start painting. If I’m lucky, a few hours later I should have something on screen that looks like what I had in my head. I’ll usually show that rough draft to a few people (especially the client, if the piece is a commission for someone else) and get feedback. It’s good to get other people to take a look at my work, because they often spot things that I’ve missed. Then, if all is well, I go back and keep painting until the thing is finished to my satisfaction. What’s your preferred medium in which to work and why? I paint on the PC, using Photoshop and my trusty Wacom tablet. I’ve been working this way for years, and I find it suits me best. I’ve found that painting digitally is really not that different from painting any other way, and it’s much more convenient and practical for me. A lot of people seem surprised when I tell them that my stuff is digital, so I hope that’s a sign that I manage to give it a painterly quality. Do you have any recent or upcoming projects to promote, or a website where people can access your work? People can check out my work on my website: www.paulmudie.com. Thank you Jared for stopping by and giving me this wonderful Guest post.